In Nepal, women are still banished to ‘menstrual huts’ during their periods. It’s time to end this dangerous tradition. Independent, May 24, 2017. As a journalist and development professional living and working in Katmandu, I have had the chance to see menstruating women’s situation across Nepal from close quarters. I found that the practice of isolating women during their period exists across the country in differing forms. The situation of women living at the rural areas is terrible. In some places, women cannot be in their own homes during their period; in others women can be in the house, but not in the kitchen and worship room. They are also forbidden from touching other people (especially male members of the family or neighbours) or cattle and from growing fruit and vegetables. SNV’s Urban Sanitation & Hygiene for Health and Development (USHHD) programme works with municipal governments to develop safe, sustainable city-wide services. 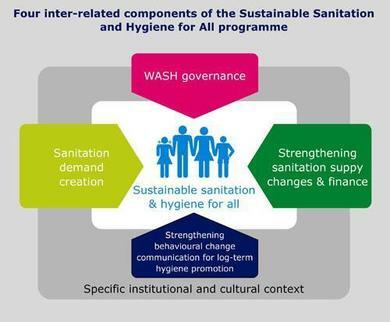 The programme integrates insights in WASH governance, investment and finance, behavioural change communication and management of the sanitation service chain. We engage private sector, civil society organisations, users and local authorities to improve public health and development opportunities in their city. Cities are clear examples of complex and rapidly changing systems, particularly in countries where urban population growth and economic development continue apace, and where the socio-political context strongly influences the directions taken. The concept of double-loop learning can be usefully applied to city sanitation planning. This paper prompts practitioners, policy-makers and development agencies to reflect on their approaches to city sanitation planning and the assumptions that underlie them. During 2012-2014, SNV did four country reviews of legal arrangements for urban sanitation and hygiene in Nepal, Bhutan, Bangladesh and Indonesia. Based on these experiences, this guide was developed to provide support and guidance for WASH practitioners undertaking a scan of legal arrangements to inform the design (use of frameworks and tools) and delivery (advocacy for improvements) of urban sanitation and hygiene programs. Septage transfer stations have the potential to significantly reduce the amount of faecal sludge entering the environment by providing a local solution for septage disposal. Localised transfer stations shorten the time required for local operators to collect and transport septage, and they will be able to use smaller vacuum tanks that can navigate the densely populated residential areas. This guide provides information on the salient aspects of selecting, designing, building, operating and maintaining a septage transfer station. Planning and financing for sanitation in cities and towns in developing countries is often ad hoc and piecemeal. Stronger capacity to plan financing for sanitation infrastructure (and services) for the long term will lead to better outcomes. Planning for adequate long-term services requires consideration of the complete sanitation service chain over the lifecycle of the associated service infrastructure. This paper focuses on access to the upfront finance and other lumpy finance needs for initial investment and for rehabilitation and/or replacement as physical systems approach their end of life. This video is one of the promotional materials used in the SHARE-funded food hygiene intervention trial in Nepal, conducted by Om Prasad Gautam, PhD Fellow, London School of Hygiene and Tropical Medicine, UK. Copyrights reserved with O Gautam.